An Evening with Pete Rose Live is a Broadway style theatrical event that captures the golden years of America’s pastime. Baseball’s Hit King, Pete Rose, shares stories of baseball’s past as only Pete can. This production uses hi-tech multimedia that creates a game-day atmosphere where the audience will be transported to the golden era of Baseball! 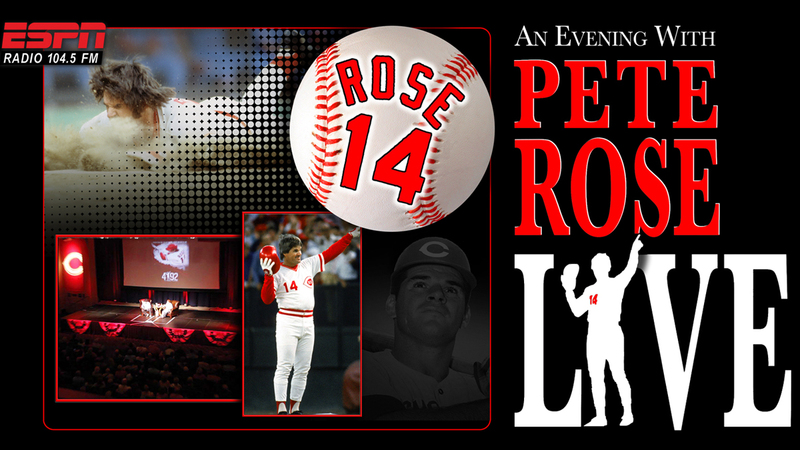 An Evening with Pete Rose Live is a Home Run! Saturday, September 15 at 7:30 p.m., the F.M. Kirby Center will spend An Evening with Pete Rose, baseball legend, presented by ESPN Radio. “4,192 An Evening with Pete Rose Live” is a Broadway style theatrical event that captures the golden years of America’s pastime. Baseball’s Hit King, Pete Rose, shares stories of baseball’s past as only he can. This production uses hi-tech multimedia that creates a game day atmosphere. The stage will be transformed into a field of memories and the audience will be transported to the golden era of Baseball. Known as “Charlie Hustle” for his hard-charging style, Pete Rose became one of the greatest players in the history of professional baseball and retired as the all-time leader in hits, games and at-bats. Rose made his major league debut in 1963 and went on to win the National League Rookie of the Year award. Rose surpassed 200 hits for the first of a record 10 times in 1965, notched batting titles in 1968 and 1969, and won Gold Gloves for his outfield defense in 1969 and 1970.